Spring has officially begun, which means two things: 1) we survived winter! and 2) summer is in sight! Summer is my favorite season, although I do love Spring so long as Boston gets the memo that we’re done with snow (seriously, no more snow please). Spring is a time when I like to really get intentional about feeling my best, ditching what is no longer serving me (hello, deep Spring cleaning! ), and just generally getting ready to fully enjoy summer. I’ve been stepping away from the hot chocolate and embracing this refreshing mint green tea soda instead, which to me, tastes like warmer weather and vacation. 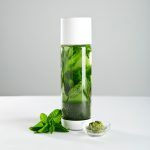 This simple soda recipe combines a few of my favorite flavors—fresh mint, green tea, and bright lemon. 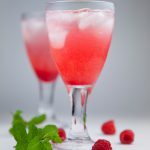 Normally sodas are overly sweet and loaded with refined sugar, so to make these just the right amount of sweet and better for you, I sweetened these with Wholesome Organic Stevia. It’s made from a combination of organic stevia and erythritol (from non-GMO organic corn), has no calories, and also no glycemic impact. Basically, it brings all of the sugar-like sweetness, without any of the harmful chemicals. 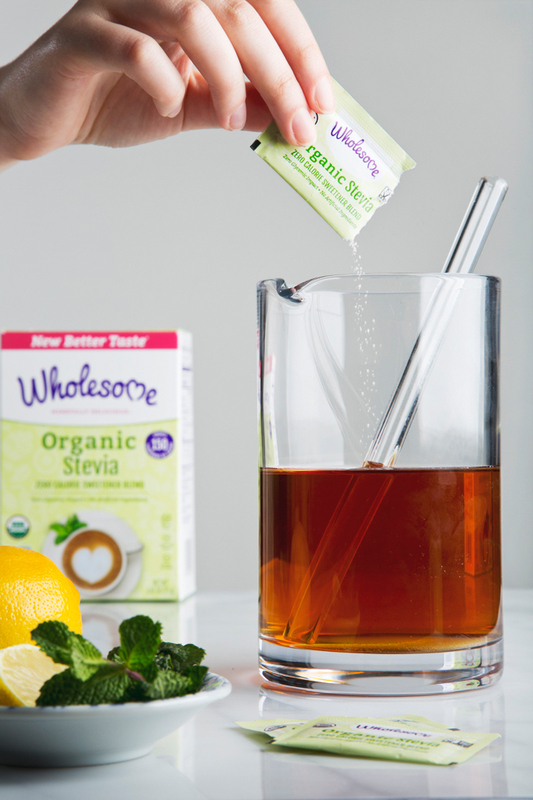 And since stevia is a lot sweeter than regular sugar, you only need half a teaspoon of Wholesome Organic Stevia for every 1 teaspoon of sugar. I normally find it in the baking aisle at my local grocer (find a store near you here), but you can also buy it on Amazon or on Wholesome’s website. 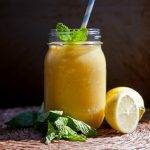 If you’re looking for a refreshing way to ring in Spring (or perhaps a way to use up some of the mint that might be starting to take over your herb garden), this drink is very easy to make. 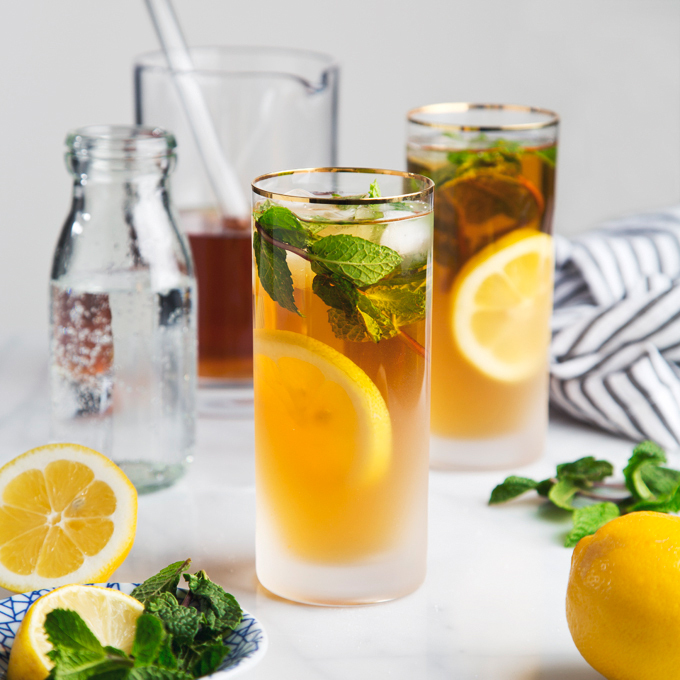 Just pour the chilled mint green tea over ice, stir in the lemon juice and a little stevia, top with sparkling water for fizz, and garnish with a lemon slice and a sprig of mint. 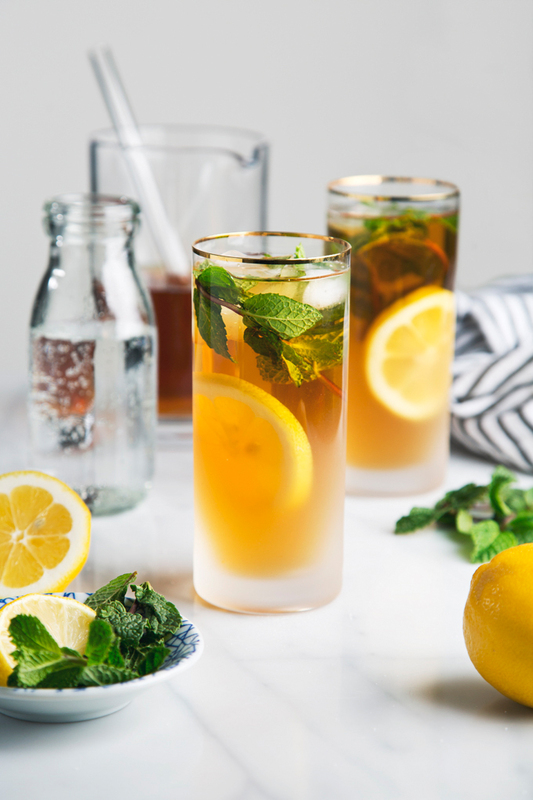 Simple and refreshing mint green tea sodas made using just five basic ingredients! 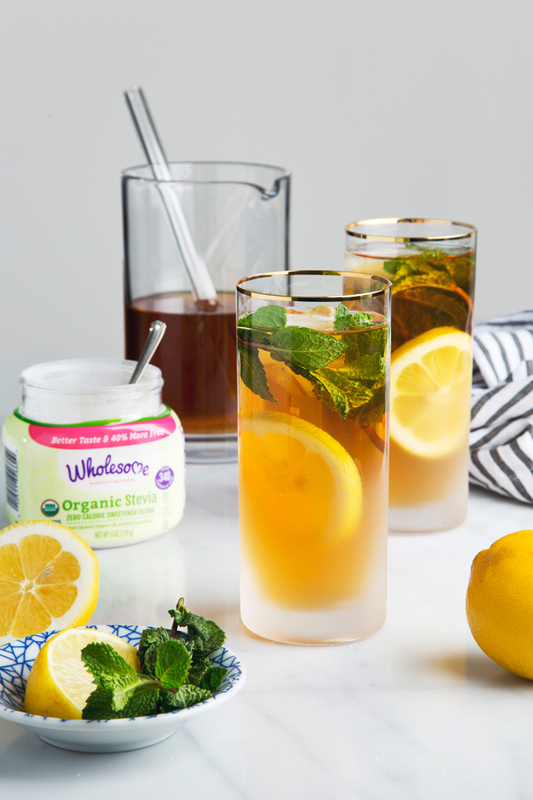 These sodas are lightly sweetened with stevia, then garnished with lemon slices and a few sprigs of fresh mint. Bring the water to a boil. Steep the tea bags in the hot water for 10-15 minutes, then discard the tea bags and let the water cool to room temperature. Stir in the lemon juice and stevia. Taste and adjust the sweetness if necessary. Add ice to 4 glasses, then pour the tea over the ice. 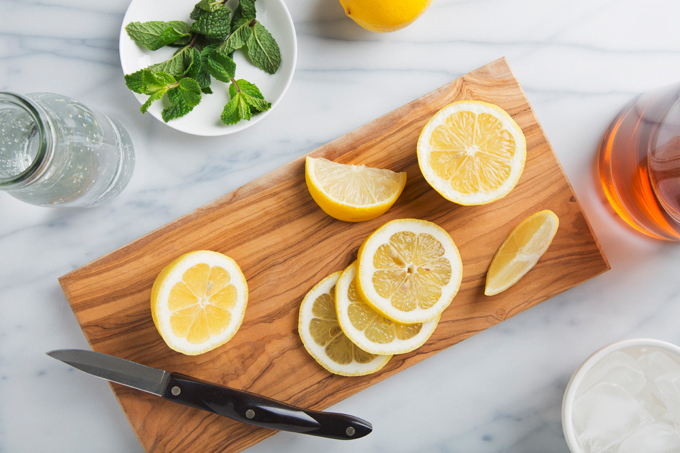 Top each glass with ⅓ cup sparkling water and garnish with a slice of lemon and a sprig of fresh mint. If you want a stronger mint flavor in your tea, feel free to steep a few mint sprigs with the tea, then remove them before serving. Thank you to Wholesome Organic Stevia for sponsoring this post! 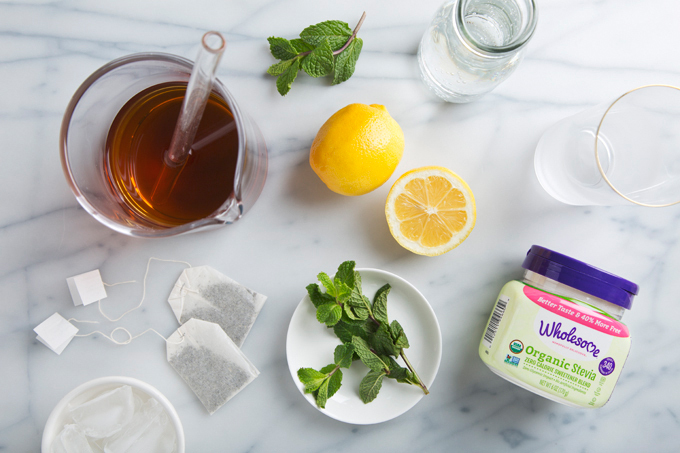 Get a coupon for $1 off any Wholesome item, or save with an Ibotta rebate offer. So pretty! They sound really refreshing and easy to make. Mint green tea is my favorite. Yum! These sound perfect for Spring and Summer and long weekends. 🙂 Your photos are stunning! I actually just picked up some of this stevia yesterday. It’s a sign! haha Looks like I need to make your mint green tea soda now! I NEED one of these! It does sound like a little taste of vacation and warm weather. 🙂 Happy Friday, Amanda! Yes, yes you do. 😉 It’s like a little staycation via warm weather beverage. I love that you didn’t use sugar in your recipe because most drinks are way too sweet. I’m trying to cut back on added sugars so this is perfect. Your recipe looks awesome! Where did you get those cocktail glasses? They’re so pretty. Thanks, Mary! The glasses are from Anthropologie. I wish this was made from pure stevia and not erythritol. I don’t like the taste of erythritol. Your recipe looks great though! I’m going to try making it with maple syrup instead. So pretty Amanda! Happy Spring! Thank you! Happy Spring, Becca! 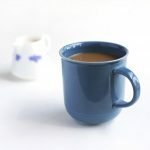 I have been trying to drink more water lately and I made your tea recipe yesterday to help with my goal. I know green tea has some caffeine but considering I used to drink 5 or 6 cups of coffee a day, this is a big step in the right direction for me. I used agave instead of stevia and it was perfect. Congrats on cutting back on caffeine in favor of more water! I know that’s not easy (and can only imagine the headaches from withdrawal), so props to you, Kasey! This looks so tasty and easy to make. Perfect for a hot summer day!